A bollard is an upright post used to control or direct road traffic, such as posts arranged in a line to obstruct the passage of motor vehicles. Metal Bollard protects various assets from impact and destruction. It is easily removable as metal bollard's locking mechanism is on the base plates. Easy to Install, Excellent barrier between vechicles and people, High gloss paint coated for high visibility. Display : Metal Bollard 76mm diameter x 820mm (H) with 150mm square base plate and 2 full loops. 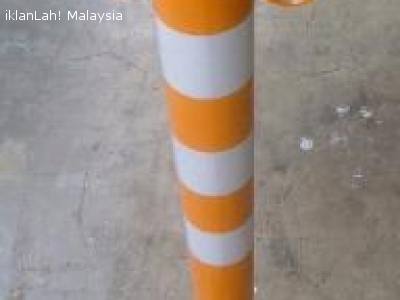 Metal Bollard 820mm (H) with 76mm or 160mm in diameter (with or without hooks) market and sale by Flexijoint Industrial Marketing & Services, Kuala Lumpur, Malaysia. For further enquiry, please contact us at T: +6 03 79541136 M: +6 016 3111313 F: +6 03 79808259 E: flexijoint.ims@gmail.com.